ماهپور, علیرضا, پوریاری, مقصود, غلامی, مهران. (1397). اثرسنجی تغییر حجم در شرایط پس از وقوع بحران (تقاضا) در محورهای برون‌شهری (نمونه موردی استان کرمانشاه). 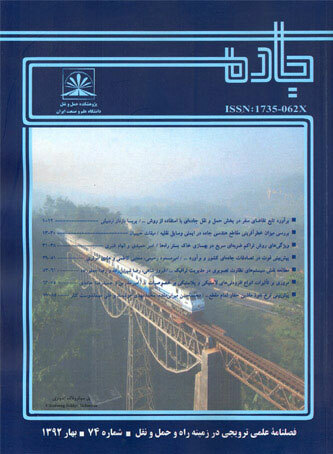 جاده, 26(95), 61-70. علیرضا ماهپور; مقصود پوریاری; مهران غلامی. "اثرسنجی تغییر حجم در شرایط پس از وقوع بحران (تقاضا) در محورهای برون‌شهری (نمونه موردی استان کرمانشاه)". جاده, 26, 95, 1397, 61-70. ماهپور, علیرضا, پوریاری, مقصود, غلامی, مهران. (1397). 'اثرسنجی تغییر حجم در شرایط پس از وقوع بحران (تقاضا) در محورهای برون‌شهری (نمونه موردی استان کرمانشاه)', جاده, 26(95), pp. 61-70. ماهپور, علیرضا, پوریاری, مقصود, غلامی, مهران. اثرسنجی تغییر حجم در شرایط پس از وقوع بحران (تقاضا) در محورهای برون‌شهری (نمونه موردی استان کرمانشاه). جاده, 1397; 26(95): 61-70. شهرستان­های غرب استان افزایش‌یافته است. شهرستان­های درگیر زلزله، شامل شهرستان­های ثلاث-باباجانی، سرپل­ذهاب و قصر شیرین است که در محورهای مواصلاتی در یک و پنج روز بعد از زلزله شاهد افزایش حجم واردشده و خارج‌شده هستند به‌طوری که در برخی از محورها تا 100درصد افزایش حجم نسبت به یک روز عادی مشاهده شده است. -Boarnet, M.G., (1996), “Business losses, transportation damage and the Northridge earthquake”. University of California Transportation Center. post-disaster recovery”. In Proceedings 6th International Workshop on Remote Sensing for Disaster Applications, Pavia, Italy. -Chang, S.E. and Nojima, N., )2001(, “Measuring post-disaster transportation system performance: the 1995 Kobe earthquake in comparative perspective”. Transportation Research Part A: Policy and Practice, 35(6), pp.475-494. -Chang, S.E., (2000), “Transportation performance, disaster vulnerability, and long-term effects of earthquakes”. Second Euro Conference on Global Change and Catastrophic Risk Management. Laxenburg, Austria. -Chang, S.E., (2003), “Transportation planning for disasters: an accessibility approach”. Environment and Planning A, 35(6), pp.1051-1072. - Cho, S., Gordon, P., Moore, I.I., James, E., Richardson, H.W., Shinozuka, M. and Chang, S., (2001), “Integrating transportation network and regional economic models to estimate the costs of a large urban earthquake”. Journal of Regional Science, 41(1), pp.39-65. - Clarke, J., Lam, J.C., Gehl, P., Taalab, K. and Corbally, R., (2016), “Risk assessment for an Italian road network due to an extreme earthquake hazard scenario and the associated landslide cascading effects. In Civil Engineering Research in Ireland (CERAI). Civil Engineering Research Association of Ireland. - Gordon, P., Richardson, H.W. and Davis, B., (1998), “Transport-related impacts of the Northridge earthquake”. Los Angeles, CA: National Emergency Training Center. - Iv., W.D., Noy, I., Okuyama, Y. and Sawada, Y., (2015), “The Long-Run Socio-Economic Consequences of a Large Disaster: The 1995 earthquake in Kobe”. Research Institute of Economy, Trade and Industry (RIETI). - Miles, S.B. and Chang, S.E., )2003(, “Urban disaster recovery: A framework and simulation model. - Noy, I. and duPont IV, W., (2016), “The long-term consequences of natural disasters—A summary of the literature”. - Noy, I., Okuyama, Y. and Sawada, Y., (2015), “the long-run socio-economic consequences of a large disaster: The 1995 earthquake in Kobe”. PloS one, 10(10), p.e0138714. - Shiraki, N., Shinozuka, M., Moore, J.E., Chang, S.E., Kameda, H. and Tanaka, S., (2007), “System risk curves: Probabilistic performance scenarios for highway networks subject to earthquake damage”. Journal of Infrastructure Systems, 13(1), pp.43-54.